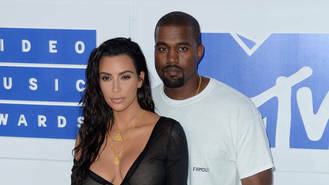 Kanye West and Kim Kardashian were among the mourners at the funeral for the rapper's baby second cousin on Friday (24Mar17). The famous couple was sombre as they dressed all in black for 17-month-old Avery Anderson's service in Los Angeles. The tot, who died in his sleep earlier this month (Mar17), was the son of Kanye's cousin Ricky Anderson, who works with the rapper at his label, G.O.O.D. Music. Kim wore a long black dress, a fur coat, and a pair of oversized black sunglasses for the service, while Kanye donned a black suit and sunglasses. Ricky posted a black-and-white photo of his little boy on Instagram earlier this week (beg13Mar17) and paid tribute to his late son, writing the caption: "Today was the worst day of my life!! I lost my lil man and gained an angel! Rest in Paradise!!!! I love you man." Avery's mother, Erica Paige, also shared an emotional post on social media mourning the loss of her son, but expressed her gratitude for the time they had together. “This life in so unfair," she wrote on Instagram. "I love you with everything inside me and it is with incredible, unbearable pain that I will have to try to find the strength to do a single thing without you. I am so grateful for being able to spend almost 17 months with you. "Thank you for all the laughs, cuddles, hugs and kisses, you took care of me in a way no one else could. My heart is forever broken. I love you so much, mommy is with you." Adele has revealed she may never tour again. Snoop Dogg is to induct Tupac Shakur into the Rock and Roll Hall of Fame. Lauren Jauregui has lashed out at gossip suggesting she briefly romanced her former Fifth Harmony bandmate Camila Cabello. Ronan Keating was told by a producer he couldn't sing in the early part of his career. Steps "cringe" when they hear '5,6,7,8'. Damon Albarn and Noel Gallagher have thrilled fans by performing their new track together at a Gorillaz gig. One Direction star Liam Payne is a new dad following the birth of his first son. Zara Larsson says Beyoncé's music is the "soundtrack" to her life.